Sequels will always have a tough task of being better than the original. We as fans have always asked “Is it better than the original?” Pacific Rim Uprising doesn’t have to do much to be better than 2013’s Pacific Rim. Replace an uninteresting lead, give us more visible action between the monstrous Kaiju and the Jaegers and improve on a story that was middle of the road for the most part. Does Uprising improve on the small things that held back the first film? Pacific Rim Uprising takes place 10 years after the war between monster and machine. With no Kaiju sightings since then, the Jaeger program is on the verge of becoming obsolete and replaced by a drone program that only takes 1 pilot to control a Jaeger. Jake Pentecost (John Boyega), the son of General Stacker Pentecost sees himself returning to the Jaeger pilot program to train a new generation of pilots if the Kaiju return. As a new threat emerges, It’s up to Jake and new pilots to save the world once again. Boyega does a fantastic job as the new lead character Jake. He forges his own path and steps outside of his father’s larger than life shadow. Charismatic at the right places and takes charge when it comes time for him to be front and center. Returning characters Mako (Rinko Kikuchi), Dr. Hermann Gottlieb (Burn Gorman) and Dr. Newt Geiszler (Charlie Day) are the only characters that are tied to the original film and they all do well. The biggest disappointment is the new additions to the cast. Nate Lambert (Scott Eastwood) is a by the book Jaeger pilot and oversees the new pilots. Eastwood is so wooden and uninteresting that he makes Charlie Hunnam’s Raleigh Becket an academy award winner. The new pilots introduced are all teenagers. While adult pilots still exist, the program aims at developing younger pilots. We spend very little time with these characters and in turn don’t care if these characters make it out alive. None of them come off likeable or relatable. Amara (Cailee Spaeny) is a featured pilot. Her story arc is similar to Mako’s but fails to make an impact and connection to the audience. Steven S. DeKnight takes over the director’s chair as Guillermo del Toro only serves as a consultant. Some technical decisions such as having most of the fight scenes during the day rather than night give a clear view of everything going on-screen. There are also more action shots outside of the Jaeger cockpit this time around. The design of all the monsters and mechs cosmetically and graphically look great. As far as the actual battles go, I felt they were few and far between. But when they happen, your inner geek can’t help from coming out. Sadly, the Pacific Rim theme is only used once during a montage and once in the credits. I’d argue it’s one of the few iconic themes that current sci-fi has. The catchy “War Ready” music from the first trailer featuring Vince Staples and Tupac is absent. 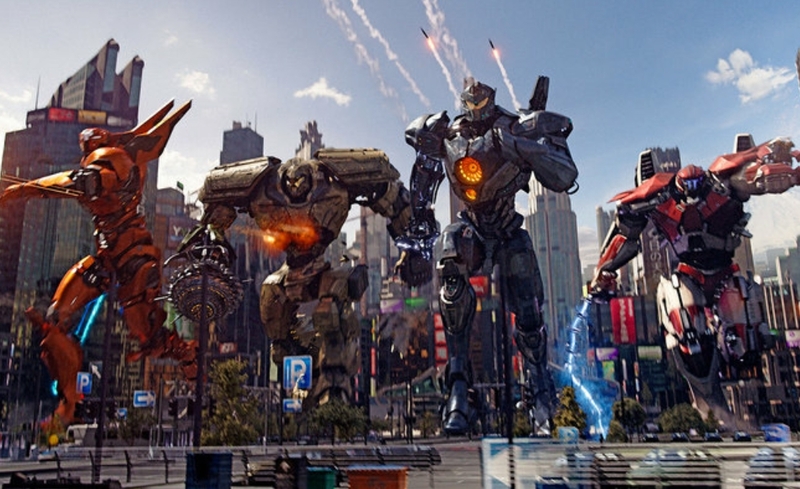 People often forget that we see movies like Pacific Rim Uprising to watch giant robots beat the hell out of monsters from another dimension and there is nothing wrong with turning off your brain for a few hours to watch mindless action and destruction.I can’t say Pacific Rim Uprising is better than its predecessor. It fails to pass the torch to new hands.